The most effective way to destroy people is to deny and obliterate their own understanding of their history – George Orwell said this, coming to think of this it is quite true. 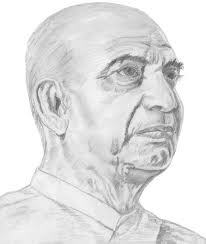 If I were to step into the shoes of any historical figure it would be Sardar Vallabhai Patel. Yes, the forgotten Iron man of India. If could step into Sardar Vallabh bhai Pstels shoes with the knowledge and understanding of today without being overtly obedient to Gandhi I would refuse to do this. Say for whatever reason I did see sense- in this nonsense I would not step down from the prime minister ship for Nehru who was a blatant stooge of British. Talking about Nehru and Gandhi like how it is with all legends the greater they sound more must’ve got left out!! At the end of the history is a set of lies agreed upon. The historians of post independent India like to say that Gandhi was the critical factor of gaining independence, Patel consolidated it geographically and Nehru the visionary lead it to its thrust with destiny. Personally with regard to history and historians I think BC means before coffee. I would never agree that “Integration of India” was Sardar’s mistake, nor he was just following Gandhi’s orders. At the same time Gandhi’s role is undeniably significant in making of united and independent India. 🙂 I honour your point of view but stand by mine. I have read India after Gandhi, Srujanmora, and I take the stand that we are a 70 yr. old country we are can not be clumped under one heading. I have been brought up by grandparents who were part of the independence struggle my view of the then era is coloured by their views, books written by Naintara saigal, VijayaLakhmi Pandit. When Sardar annexed states there was commitment made most of them are not honored. When we say History it is always whose history? and whose point of view. Maybe you should read Mihir Sharma. Maroof Raza it will give you another view of what is happening. A contra common view. Interesting!